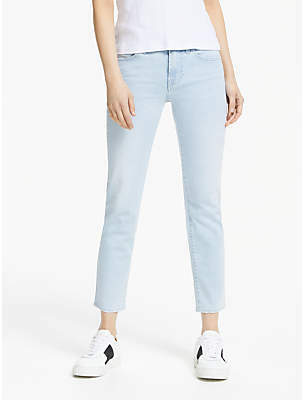 Women's cropped skinny jeans from Los Angeles-based brand, 7 For All Mankind. Crafted from Slim Illusion Luxe denim with superior shape-retention and a 'second-skin' feel that sits close to the body for enhanced comfort. The mid-rise jeans showcase a classic five pocket design with a button closure, a zip fly and signature logo tag branding to the back. Belt loops and metal rivets also feature. Complete with tonal stitching throughout. 56% Cotton, 21% Viscose, 14% Modal, 7% Polyester, 2% Elastane Model is 174cm/5'8.5 and wears a size W26.